Exciting new pilgrimage! 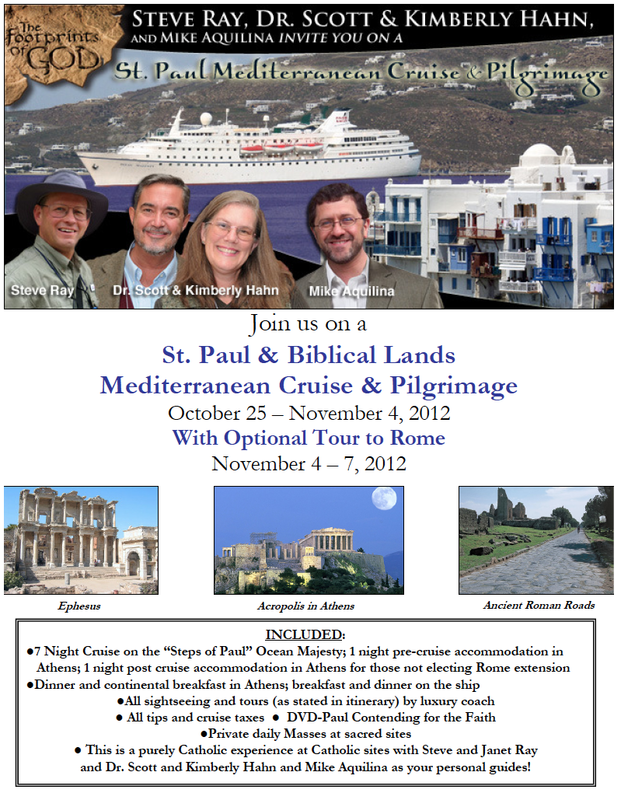 Steve Ray, Dr. Scott & Kimberly Hahn and Mike Aquilina invite you to join them on a cruise thru the Mediterranean Sea. We will sail and walk in the Footprints of St. Paul, the Blessed Virgin Mary, St. John the Apostle and more. We will even the Island of Patmos where St. John saw Mary the Queen of Heaven and where he wrote his Book of Revelation! We chartered our own ship and we arranged EVERY site to be a biblical site! We tour the Scriptures with daily private Masses where St. Paul celebrated Mass. We also pray Mass at Mary’s House in Ephesus. And so much more including daily seminars on St. Paul and the Catholic Faith. And there are no extra charges for the daily excursions. All tips are included. To register or get more information contact Susan at SReinhardt@CTSCentral.net or by phone at 3135658888, Ext 161.